Created in 2012, the Law Firm Leadership Circle is made up of a distinguished group of law firms whose outstanding generosity demonstrates a commitment to joining the bar foundation’s efforts to increase the legal profession’s impact in the community. Each firm has made a financial commitment to the foundation by pledging to donate to the Leadership Circle campaign over three years to secure the administration of the foundation’s outstanding pro bono, community and professional programs. 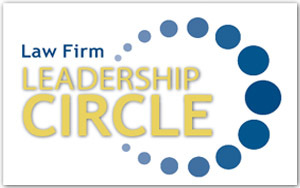 For more information on how your firm can join the Leadership Circle, please contact Lorrie Albert at 412-402-6640 or lalbert@acba.org.